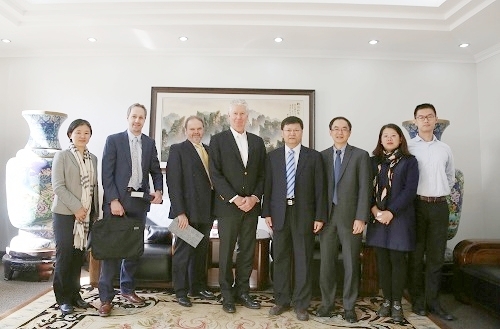 On October 30th, a delegation from the Asia Pacific Foundation (APF) led by its President and CEO Stewart Beck met with C-CBC Directors Xiaotao Bi and Tianwei Tan at Beijing University of Chemical Technology (BUCT). 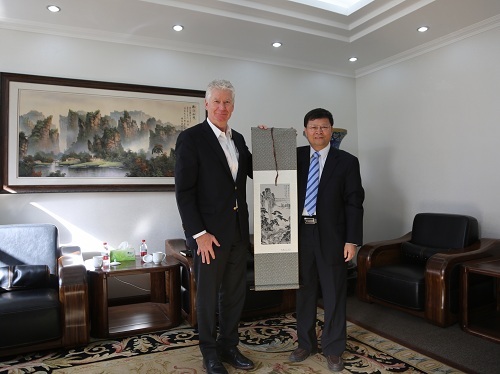 They discussed bioenergy's role and contribution to the overall energy portfolio in the two countries, and prepared for the next Track II Energy Dialogue meeting between Canada and China. The ongoing Track II Energy Dialogue follows up on a commitment made by Prime Minister Justin Trudeau and Chinese Premier Li Keqiang in September 2016 to develop and reinforce bilateral co-operation in the field of energy. APF Canada and ETRI of CNPC are acting as the Secretariats for Canada and China, respectively. Mr. Stewart Beck is the Canada Co-Chair; Jiang Xuefeng, Vice-President, ETRI of CNPC, is the China Co-Chair. Two meetings have been organized for the Track II Energy Dialogue where Canadian and Chinese experts discussed the Canada-China energy relationship and further developed a set of recommendations that would support enhanced bilateral energy trade and investment. The Dialogue covers a full spectrum of energy subsectors including: renewables, energy efficiency, Indigenous inclusion, oil, natural gas, and nuclear. The initiative was highlighted in the Canada-China Joint Statement on Climate Change and Clean Growth issued on December 4, 2017 in Beijing.